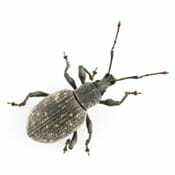 The adult strawberry root weevil is about six millimeters long, and is dark brown/black in color. They are often found in the leaves and foliage of the plants they feed on. The adult weevil’s elytra are fused together, which means they are unable to fly. The larvae can be up to thirteen millimeters long when fully grown and they are found near the roots of the plants they are infesting. The larvae are white, legless, with a darker colored head and are often C-shaped. The plants that the strawberry root weevil feeds on include strawberry, raspberry, rhododendron, grape, and peppermint and they have also been known to feed on grasses. Adults feed nocturnally on leaves and stems, leaving notches and causing slight damage, while the larvae cause significantly more damage by feeding on the roots and crowns of the plant, even as they overwinter, if the temperatures are mild. The plants that are fed upon by the larvae are stunted and have reddish leaves that curl exposing the underside, and the plant wilts as the fruits form, especially in dry weather. Treatment starts with a thorough inspection for the primary source of the infestation and any conducive conditions. After that recommendations are made for good sanitation/elimination of conducive conditions and contaminated food. Then a pesticide application maybe preformed when necessary.